Home › History and traditions › Where are all the women? Everyone – this blog included – talks about the famous men of the waterways. The great engineers, like Brindley, Telford, Jessop and Rennie, who made it all possible. The working men through the ages. Tom Rolt and Robert Aickman, who rescued the canals from closure. But where are the women? You might catch an occasional glimpse of a woman in an old picture of working narrowboats, probably with the caption “wife of narrowboat owner hard at work”. You might see another old picture, this time of some young women leaning next to a boat – one of the Idle Women who were sent to work on the canals in WW2. But that can’t be it, right? So here’s a little roundup of famous women of the waterways. In no particular order and by no means exhaustive. Tom Rolt decided he wanted to go on a canal trip so looked around for a woman who would accompany him in what was, at the time, a pretty alternative way of life. He married Angela. She appears to have – to Rolt at least – no other personality traits worth mentioning than this spirit of adventure. She once wore a yellow jumper. She once got some milk from a local farmer. She likes riding a bike. She was allowed to tiller the boat on a single occasion when her husband had to lean off the front to pull weed out of the canal. As I read the book, I grew more and more fascinated with this shadowy, enigmatic cipher of a woman. What did she think about the trip I wondered? Where was she from? Did they love each other or was it a marriage of convenience because they both fancied a jolly time on a boat? I think I read somewhere else that she ran away from Rolt to join the circus. Secretary of the IWA, Aickman describes the great author herself as “one of the most brilliant [of women]” and a bit of a looker “so beautiful that continuous problems arose, especially when, at a later date, she joined the Association’s Council. Little in the way of completely normal business was possible or sensible, when she was in the room. … By merely existing, she promoted loves and hates which, through no fault of hers, left some who felt them, fevered and wasted”. Aickman, I despair. I really do. Words can’t express how I feel right now. At Wardle Lock, near Middlewich, I stumbled across this little photo on a display by the side of the canal. 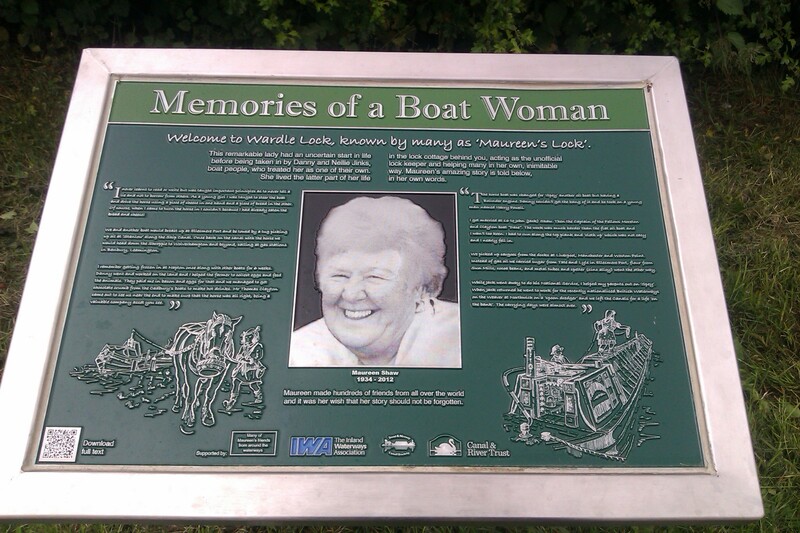 Maureen (1934-2012) was adopted by boaters, spent her life around boats and acted as unofficial lock-keeper at Wardle for years. Go Maureen. Well said Emily! Women often get ignored or glossed over, particularly when it’s anything to do with engineering or war-time daring-do. Just look how long it took for Land Girls to get more than a mention. Really liked this piece Emily. Check out the Canal River Trust site for their post on International Women’s Day re 100 women of the Canals. There’s even a book on the way………. I found your comments searching for more info on Angela Rolt myself. She and Tom had fallen out with the Inland Waterways Association and she wanted to go and cruise the canals in Europe. He wanted to stay in England so she left and joined Billy Smart’s Circus as assistant ringmaster! She later moved to France and lived there until she died I think. She loved the cruising on Cressy and Ian Mackersey’s book, The Cressy Years, has interviews with her after she had left Tom. She was related to Royalty somewhere down the line and that had always created problems as her father would not speak to either of them as she had “married beneath her”. Her mother kept in touch when she could but Tom & Angela were always frightened that her father would cut off her slender “allowance” which would mean they would have to give up the boating life and get jobs !! Thank you so much for commenting and filling me in on Angela… I shall have to get hold of The Cressy Years and read up. I think it must have been a fascinating time to live through – I half wish I had been alive then – all those changes and you get a sense of real freedom for the first time. I’ve just finished reading Elizabeth Jane Howard’s memoir Slipstream, which gives a very different view of the Howard-Aickman relationship! Eily “Kit” Gayford, trainer of the “Idle Women”, is worth a mention, too. Her book is called The Amateur Boatwomen. She also features in Susan Woolfitt’s “Idle Women”. Then there’s Rose Skinner, wife of Joe, of the NB Friendship – the last of the “Number Ones” who worked the Oxford Canal with their mule Dolly. And Sister Mary Ward of Stoke Bruerne, a nurse who worked to improve the lives of the boatmen and their families, financed from her own pocket for many years.